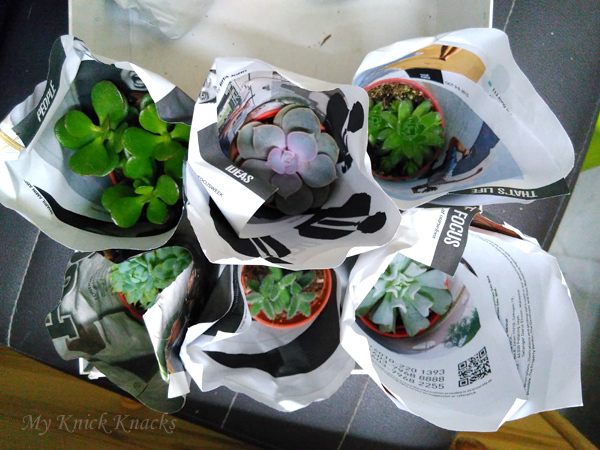 Succulents are popular for two simple reasons: they are beautiful and nearly indestructible. 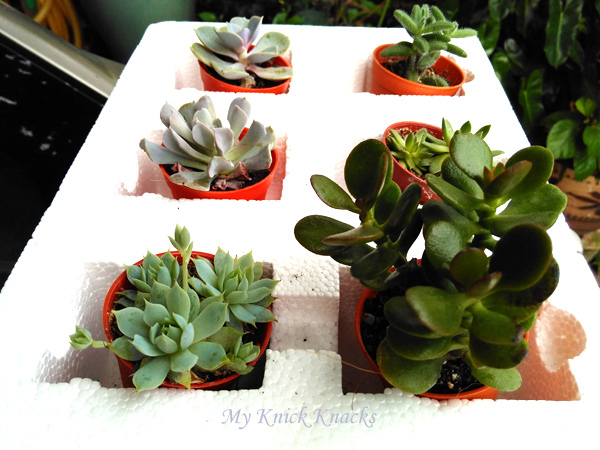 I am into succulents now because they are hardy and easy to take care and I have bought a few mini succulents back from KL during my last trip to Semenyih. 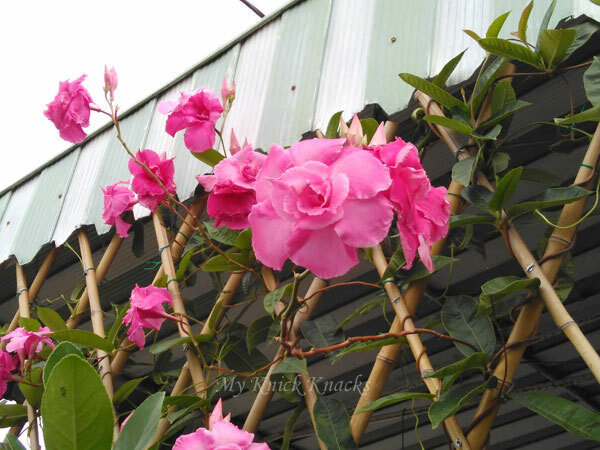 I asked a dear friend to get them for me and she took pictures from the nursery and asked me which one I wanted...such a great friend. With whatsapp...it is so much easier to get stuff for friends..just point , shoot and send :) and here I would love to share with you the ones she bought for me on my behalf. 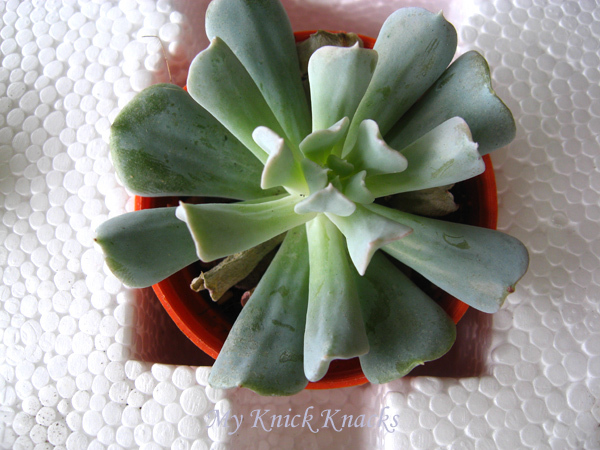 A succulent is any plant with thick, fleshy (succulent) water storage organs. 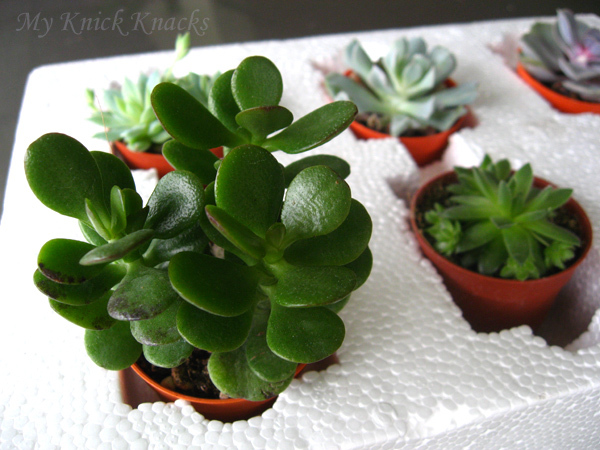 Succulents store water in their leaves, their stems or their roots. These plants have adapted to survive arid conditions throughout the world, from Africa to the deserts of North America. This adaptive mechanism has resulted in an incredible variety of interesting leaf forms and plant shapes, including paddle leaves, tight rosettes, and bushy or trailing columns of teardrop leaves. As a group, succulents include some of the most well-known plants, such as the aloe and agave, and many almost unknown plants. Succulents make excellent display plants in dish gardens. 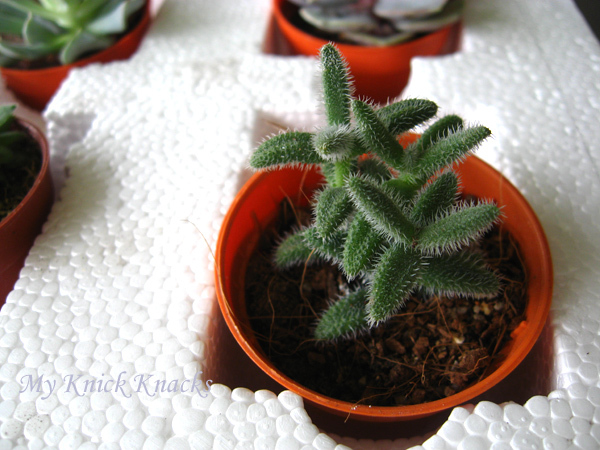 No matter what kind of succulent you're growing, the rules are pretty similar between the different species. 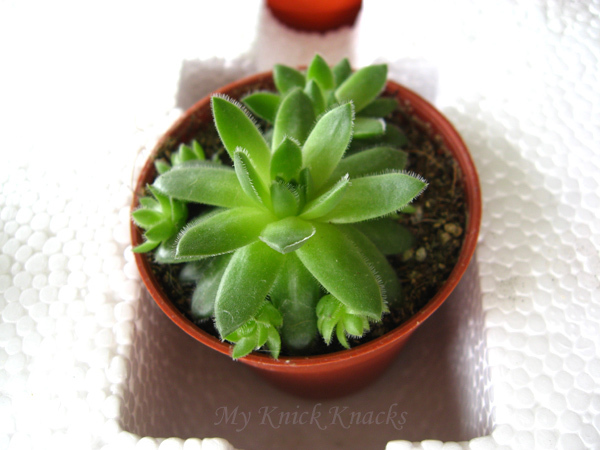 Succulents prefer bright light, such as found on a south-facing window. Watch the leaves for indications that the light level is correct. Some species will scorch if suddenly exposed to direct sunlight. The leaves will turn brown or white as the plant bleaches out and the soft tissues are destroyed. Alternatively, an underlit succulent will begin to stretch, with an elongated stem and widely spaced leaves. This condition is known as etoliation. 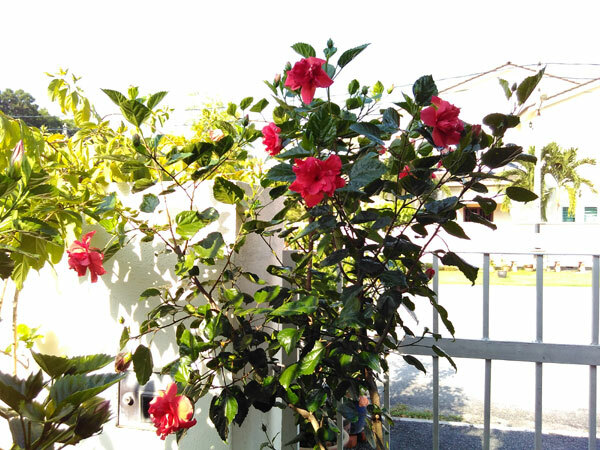 The solution is to provide better light and prune the plant back to its original shape. Many kinds of succulents will thrive outdoors in the summer. Succulents are much more cold-tolerant than many people assume. 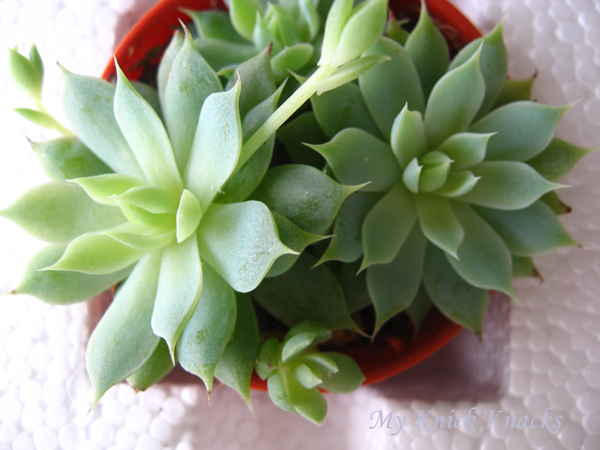 is a plant belonging to the succulent genus Graptopetalum. are very popular cold hardy and drought tolerant succulents. from velvety, wooly, and satin, to fringed, tufted, and spidery webs. others are tiny (only 1/4" diameter ). 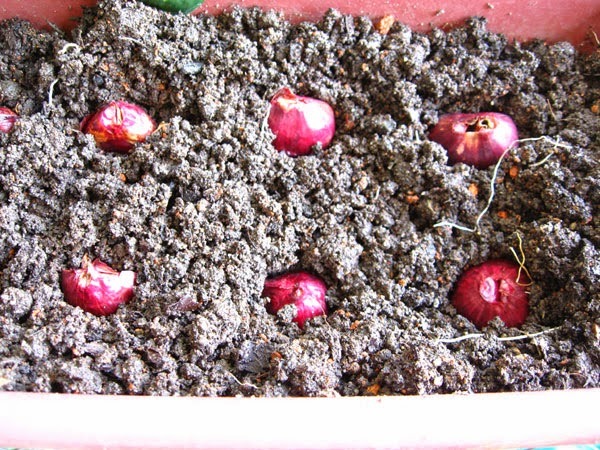 Most produce tight clumps that form interesting mounds. the darkest of purple, to delicate pinks. and some that have the appearance of stones. Sempervivum will produce multiple “baby chicks” per growing season. you can usually count on at least four chicks per season. and start a new planting elsewhere. covered in tiny white translucent hairs. Masses of yellow flowers in summer. (South Africa). Sun/part sun. leaf tips pointing inwards towards the center of the plant. individual rosettes to nearly 1 foot across. tall arching inflorescence, usually in late summer or fall. some light shade in hot climates. Water occasionally. past Huntington Botanic Garden Director Myron Kimnack. sometimes referred to as pruinose. solitary rosettes that eventually grow up on a slender stem. irrigate occasionally to often. Hardy to 25°F. from being deheaded and rerooted every 3 to 4 years - a nice plant in a pot. who was considered a famous succulent plant grower in his time. as ISI 1138 Echeveria 'Pearl of Nurenberg'. 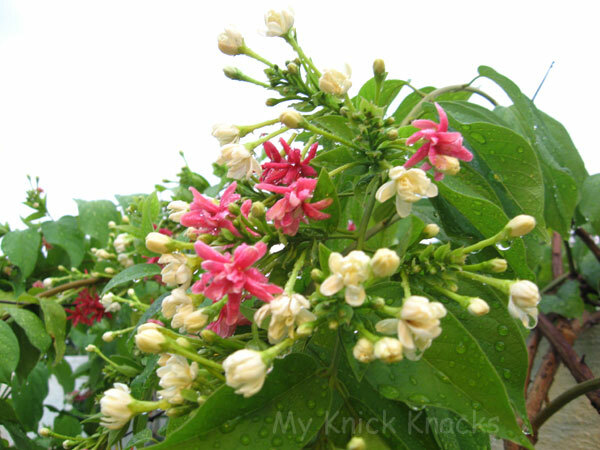 described it as one of the most beautiful plants that one can grow. 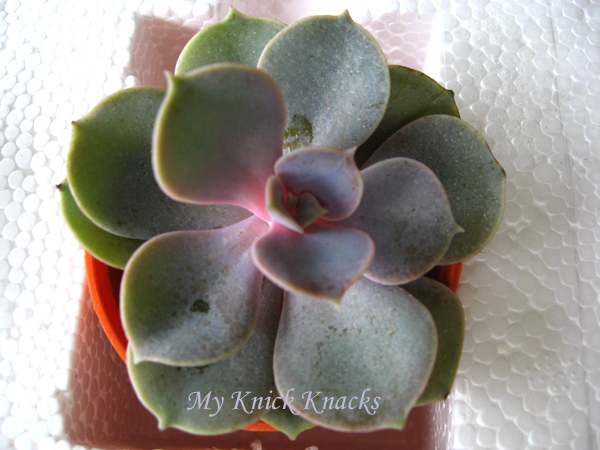 is a succulent plant with small pink or white flowers. is common as a houseplant worldwide. Pachira aquatica also receives this nickname. The jade plant is an evergreen with thick branches. although some may appear to be more of a yellow-green. when exposed to high levels of sunlight. My nephew Jarod will be getting married early next year and being his aunt , I was asked to give tips and advises as my own son just got married six months ago. It was a first wedding preparation for his parents and I can imagine the excitement and my nephew wanted a garden wedding too like his cousin. Preparation can takes up to six months...booking the venue, invitation cards to be printed in time , wedding cake from the best baker in town and booking the best restaurant in town has to be done early. Though the preparation can be tedious but it can be fun too. The first item for his wedding preparation has been taken care of. Wedding rings - Jarod and his wife to be has chosen a pair of 18kt Yellow Gold and Platinum 7.5mm Wedding Band. The first item for his wedding preparation has been taken care of. 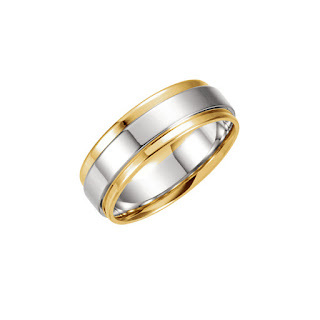 Wedding rings - Jarod and his wife to-be has chosen a pair of 18kt Yellow Gold and Platinum 7.5mm Wedding Band from Joy Jewelers platinum bands -a 18k yellow gold channel sleeve with a center insert of platinum for a bi-colored appearance only on the outside of the band. It has a grooved edge, flat center and polished finish 18k yellow gold and platinum 950 and has a hallmark PLAT on the interior. A comfort fit of 7.5mm width. Size 7 band weighs approximately 12.78 grams and is made in the USA. I love pepper bells and especially the yellow ones...so sweet and fragrant. So I decided to grow a plant to see how well I can manage to grow pepper bells. It was a great experience even though I did not managed to grow the bells to maturity. 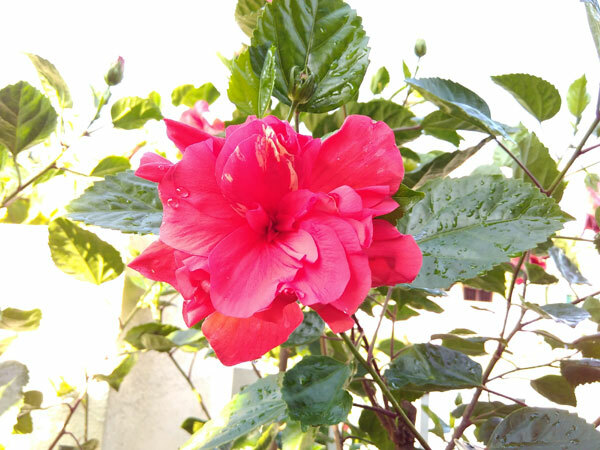 Learning process and through the process, I learn a lot and would like to share with you the common factors that why blossoms dropped before they can be pollinated. Thought I would like to share with you in case you too would like to grow your own pepper bells. Mine produces lots of blossoms but they dropped and two managed to be pollinated but was attacked by Cyclamen Mites causing the fruit to have ' rust ' texture on the skin. 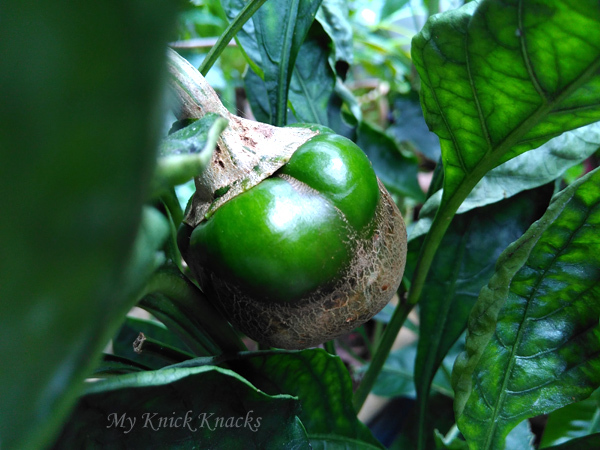 I have shared below the two important factors when growing pepper bell. 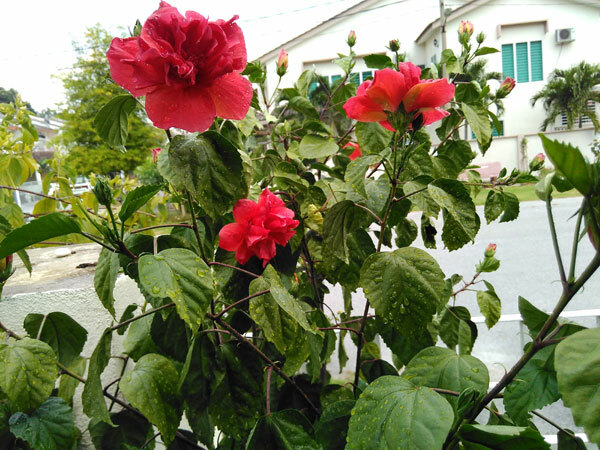 Hope it helps you to understand why the blossoms doesnt stick to the plant :) And when you have the ' rust ' like texture, you will know what causes it. Temperature. 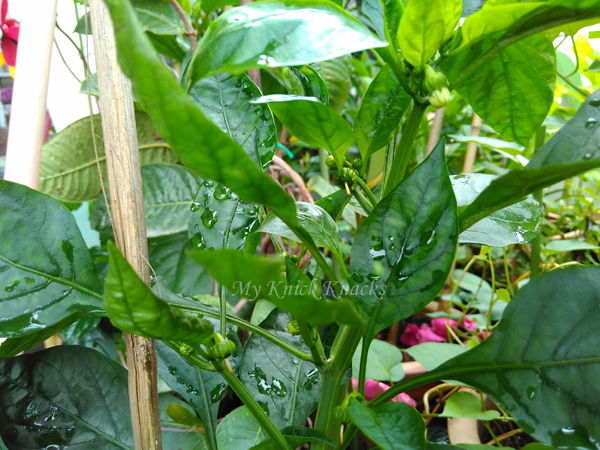 Pepper plants are extremely sensitive to temperature. This is probably one of the most common causes for lack of flowering or bud drop and one of the most likely to suspect first. Optimum daytime temperatures for bell pepper varieties are between 70 and 80 degrees F., with up to 85 degrees F. for hot varieties, like chili peppers. Nighttime temperatures falling below 60 or rising above 75 degrees F. are also indicative of bud drop. 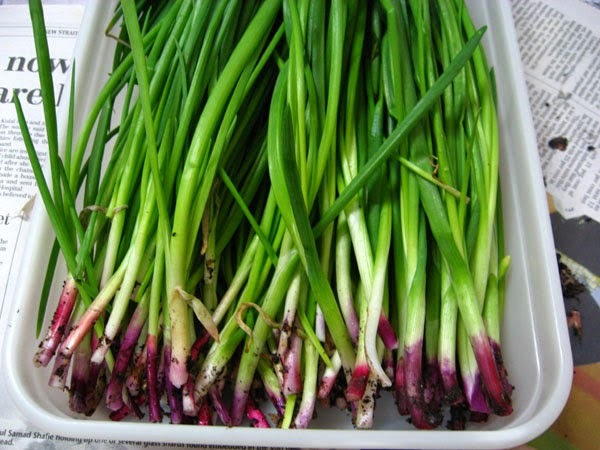 In addition, overly cool conditions, especially early in the season, can prevent buds from forming. 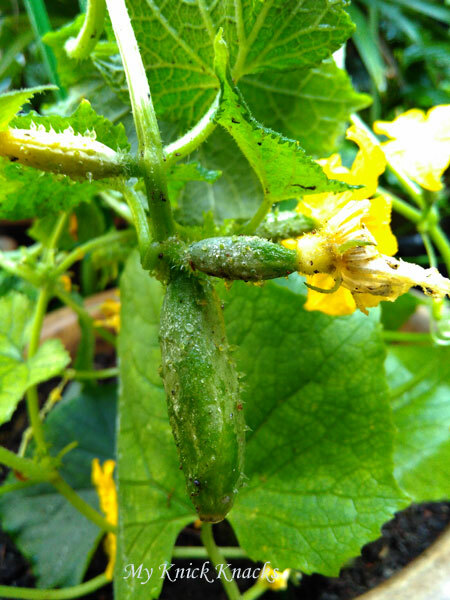 Poor Pollination. 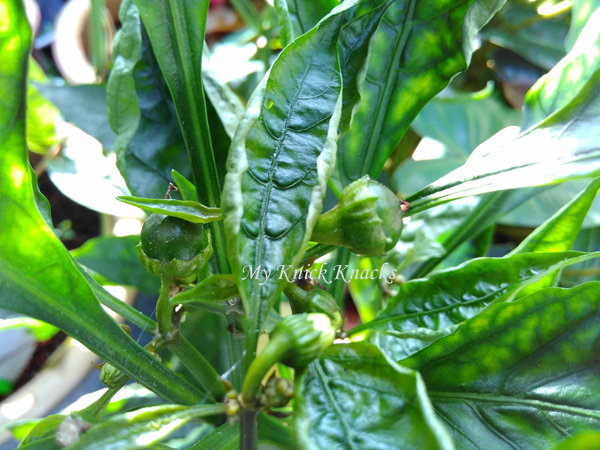 A lack of pepper flower production or bud drop can also be contributed to poor pollination. 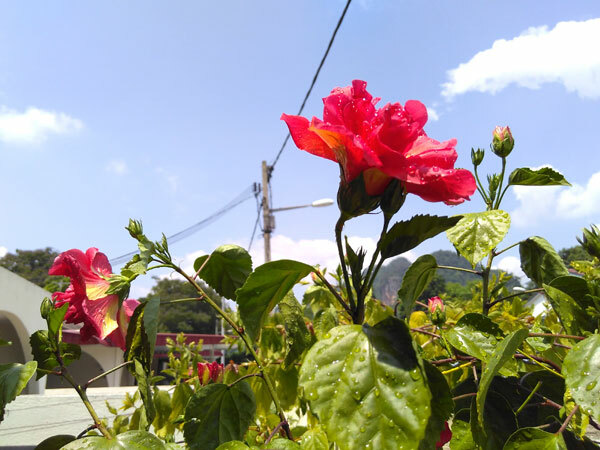 This can be due to a lack of pollinating insects, such as bees and butterflies, in the area. To help alleviate this problem, you may need to entice pollinators to the garden by adding some bright colored flowers nearby. While there are also blossom set products available, they are not full proof and may be time consuming to apply. Poor circulation, which contributes to pollination, may also be to blame. While moving in-ground plants may not be feasible at this point, container grown peppers can be relocated. In addition, pepper blossoms are even more sensitive to the temperatures during pollination. Fertilizer/Water Practices. 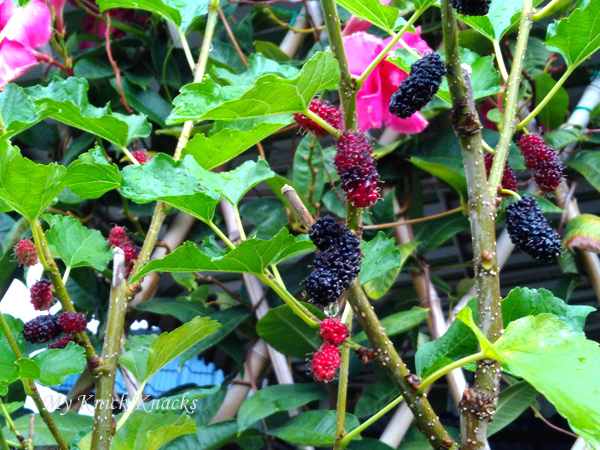 Oftentimes, too much nitrogen fertilizer will affect pepper blossoms. 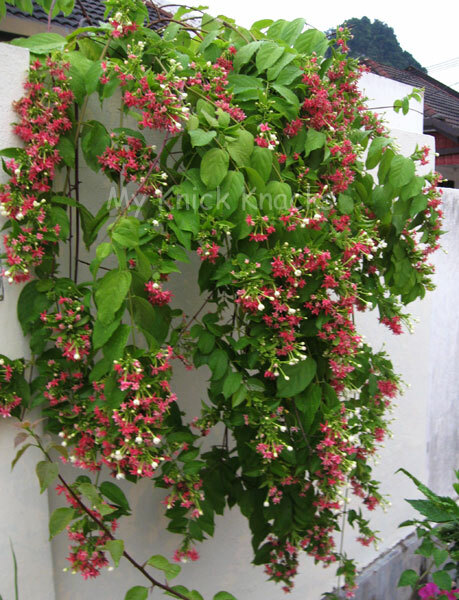 Instead of producing a pepper flower, the plant puts all of its energy into foliage growth. 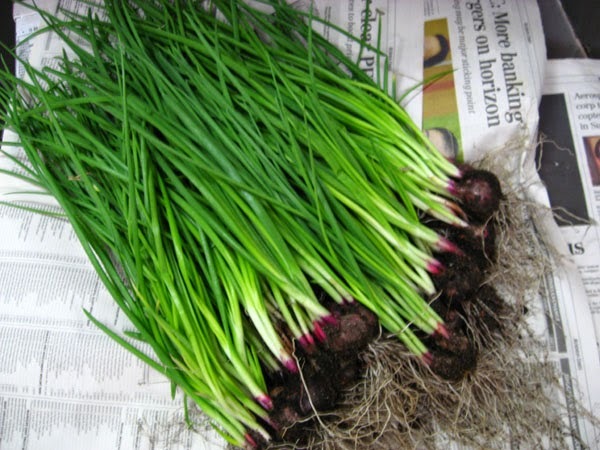 However, low fertility and low moisture levels can also result in poor flowering, bud drop and stunted growth. You can try adding a teaspoon of Epsom salt to a quart of water and apply to plants to help improve fruit set. 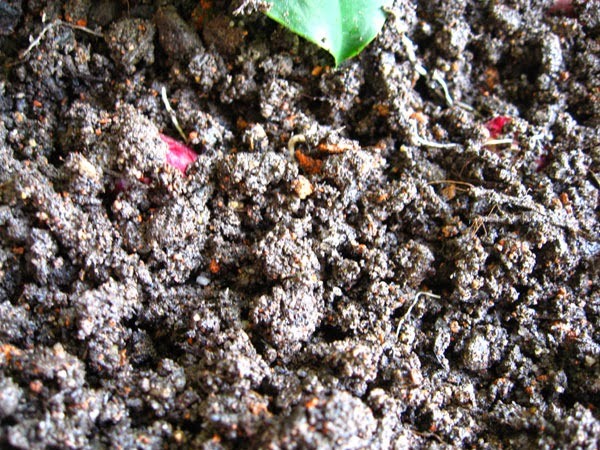 High phosphorus fertilizer, or bone meal, can help offset high nitrogen levels too. 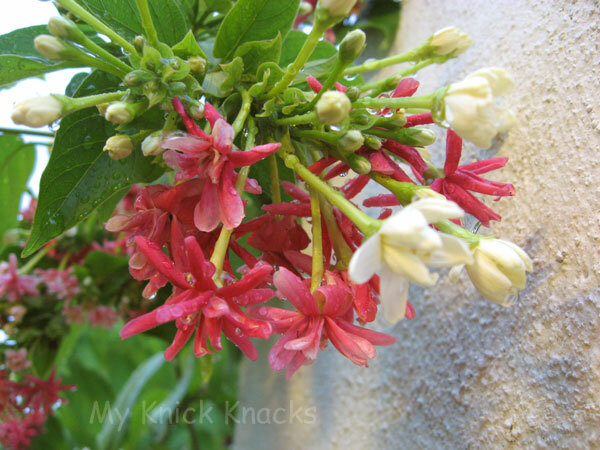 Uneven watering or drought will cause pepper flower and bud drop. Try to avoid overhead watering and use soaker hoses or drip irrigation instead. Water regularly and deeply. 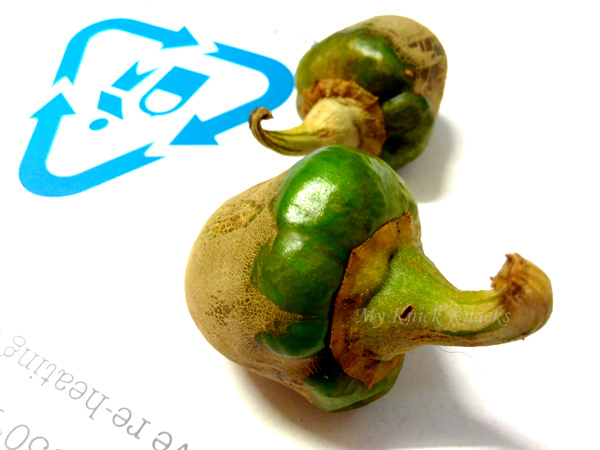 One of my favorite ‘oddball’ samples is peppers damaged by mites. 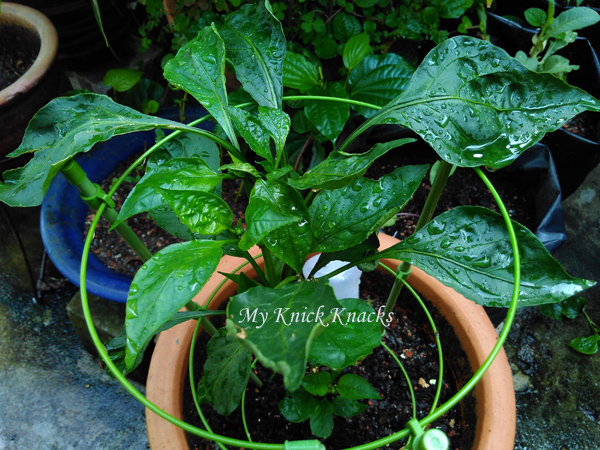 The peppers look like potatoes growing on the plant the way they are scabby and misshapened. 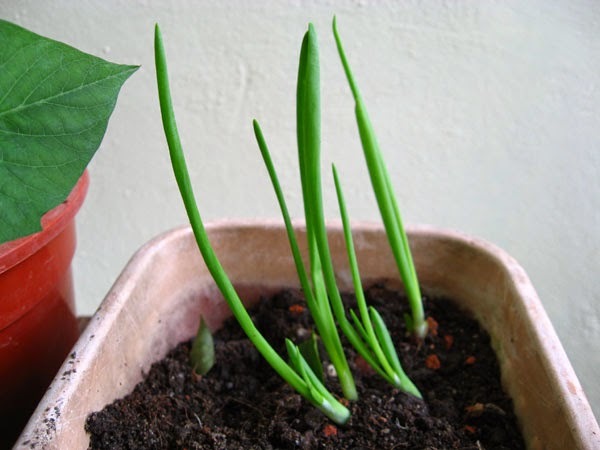 Cyclamen mites are the most likely culprit for these dramatic symptoms. 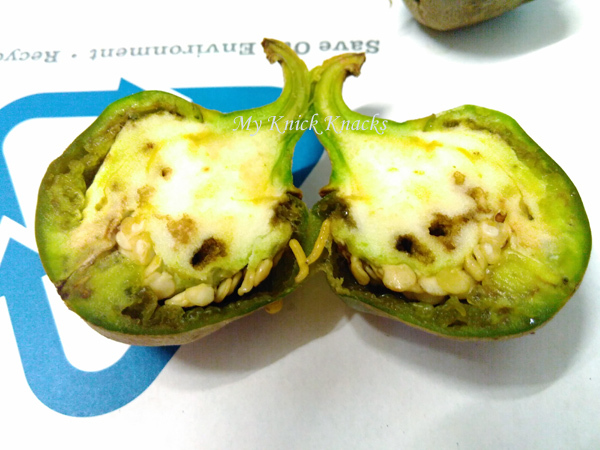 The mite feeding causes the peppers to russet; the russeting is brown and rough to the touch and appears over large portions of the pepper. If you look closely the russeting has a crackled or net-like appearance. 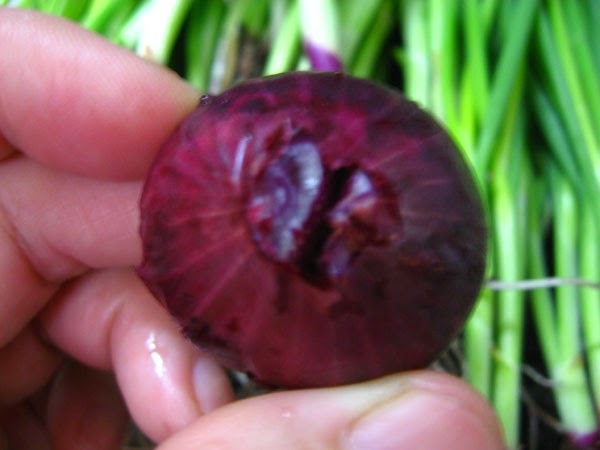 Cyclamen mites cause this impressive damage by feeding on the young developing fruit. 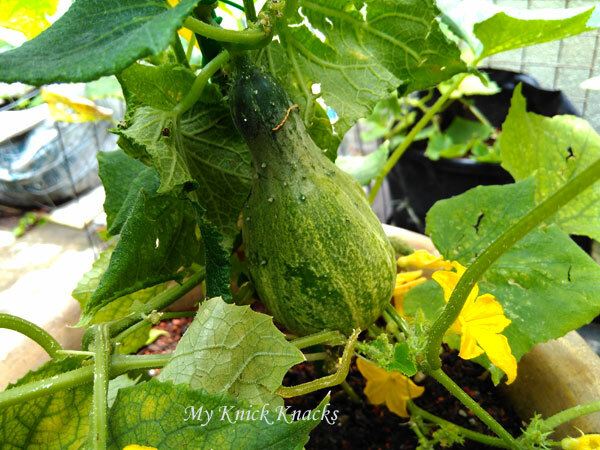 They inject auxins (growth regulators) as they feed which cause the fruit to form the russeted appearance. It does not take very many mites to cause damage. 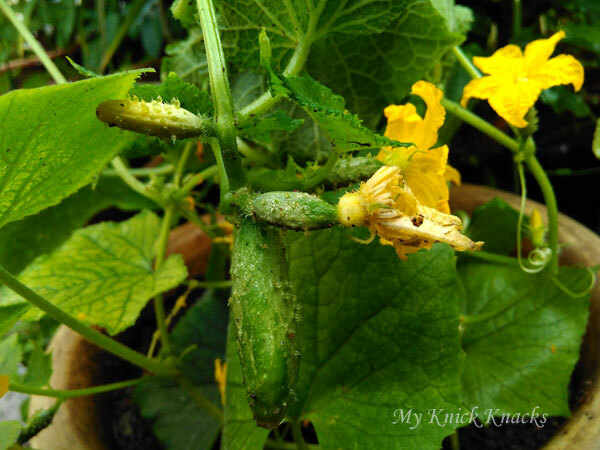 Once the damage is apparent the mites are long gone and curative treatment is not possible. Controls focus on cultural methods that prevent cyclamen mites from getting to the peppers. Problems with peppers in greenhouses are often from cyclamen mites moving onto the pepper plants from nearby ornamental plants, so keeping ornamentals away from peppers can reduce the chance of damage. In a field situation strawberries can serve as a source of cyclamen mites that infest nearby peppers. The damage is only skin deep with the inner tissue appearing normal. I suspect the peppers could still be eaten but I think the skin would be a bit too chewy! Luckily cyclamen mites are only an odd occasional pest of peppers and this is not something that most gardeners will ever encounter. 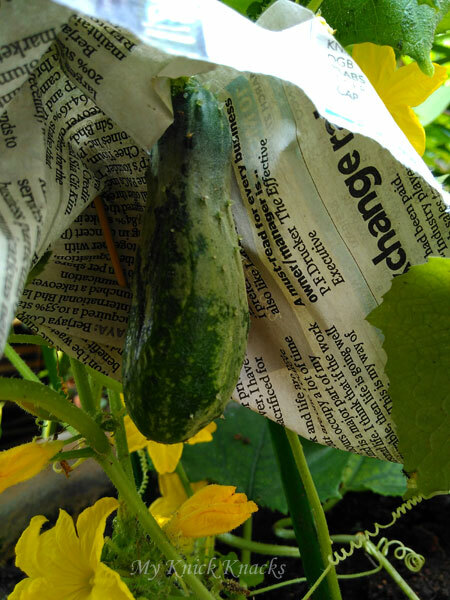 Severe russeting of high-tunnel-grown peppers apparently caused by cyclamen mites. the whole pepper was infested with worms...so scary! Ok , first I think I will head over to musical store MF and see what they have in store for Christmas. I am sure they have special Christmas sales going on. If there are , I am sure to get Piggy Josh something from there since he loves music. I can't wait for them to be back celebrating the joyous occasion of Christmas together. 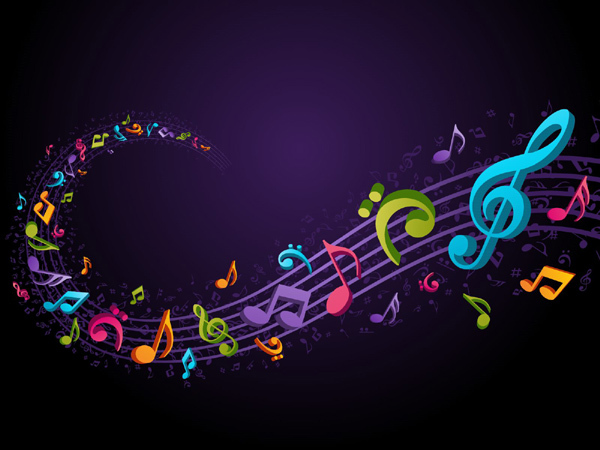 Food and music are a match made in heaven. 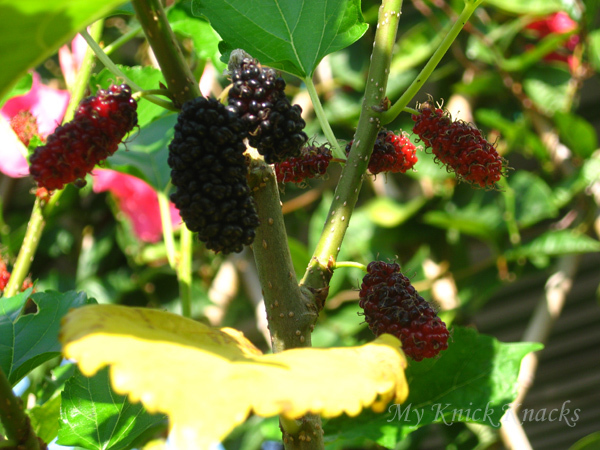 Wheeeee.....I was away for almost two weeks and came home to a bunch of ripening mulberries. 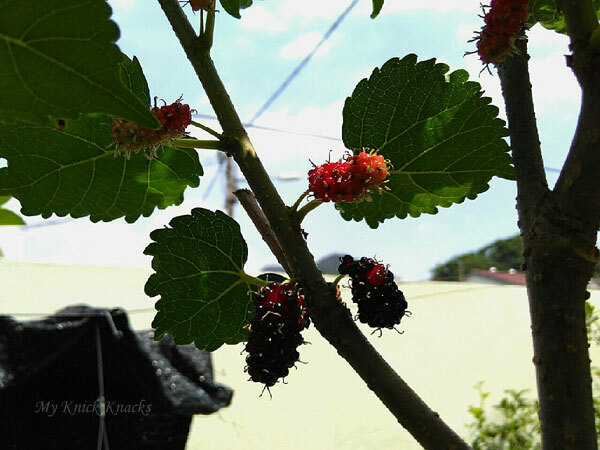 Whoa...the fruits are big , sweet and juicy. 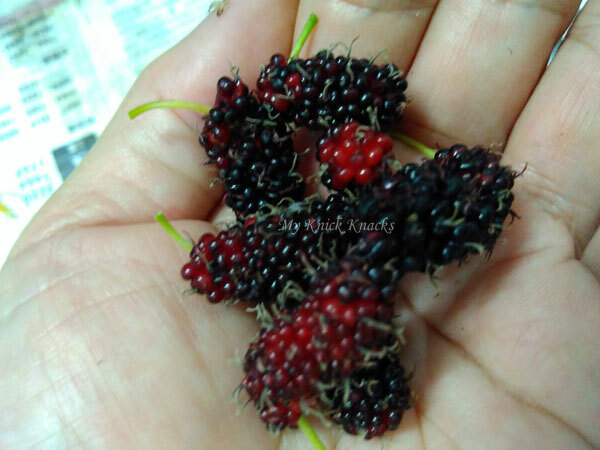 I plucked them as they ripen...this time , it was dark red..almost like blackberries and surprising the birds did not come and take their share of it. 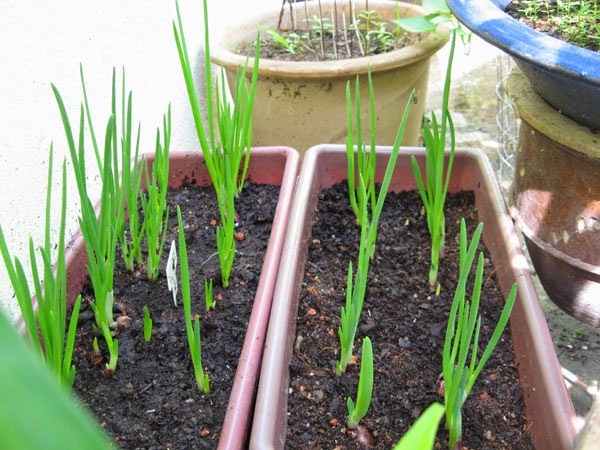 I have used Fish Amino Acid as organic fertiliser and I am really happy with the result. 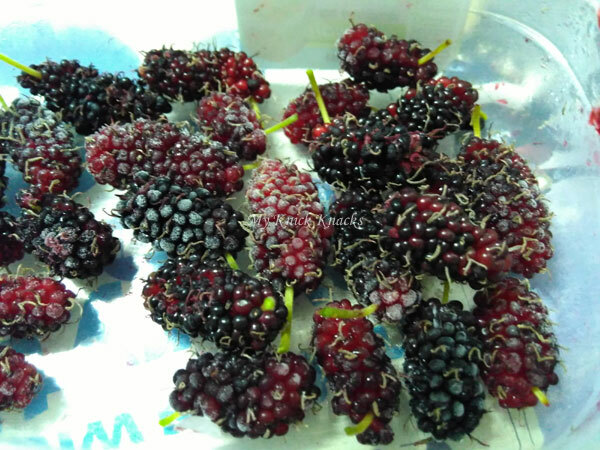 After every fruiting, I will trim the plant and let it sprouts new branches and meanwhile time to feed them FAA. 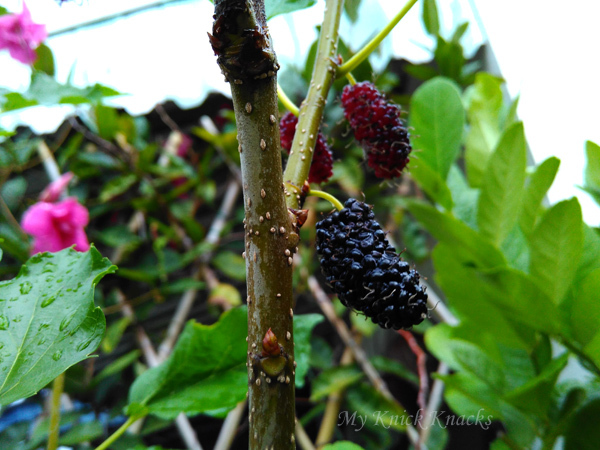 Check out my post on homegrown mulberry post before using FAA, they fruits were skinny and dry. 1 part blended fish guts to 1 part brown sugar. Mix together and store in air tight container. Keep in dark place for 3 months. My buddy Julie is so excited about Shopback.my. She was telling me about it the whole time we were in Bible class last Wednesday. She told me that Shopback.my will be having their biggest Black Friday Sales and massive Cyber Monday Sales too . 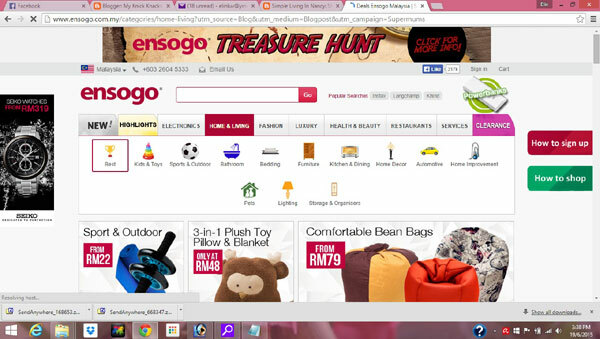 Oh, in case you do not know what Shopback.my is, it is actually an e- commerce platform for best deals and many people love this great site for shopping deals and cashback. I can understand now why Julie is so excited because Aliexpress , one of her favorite online shop is having coupons with great deals and with cashback too on any purchases online. Julie loves travelling and Expedia is giving great deals too . She managed to make us all sign up for this great shopping website so that we too get to enjoy great Aliexpress coupons. What a wonderful friend Julie is to us as the saying goes " caring is sharing ". We are all looking forward to great deals and cashback and this indeed would make shopping so much easier, needless to say with the cashback, we would have save more money ! So I am also sharing here with you guys the good news that Julie shared with us, so that you get to enjoy great deals and cashback as well. Not to forget sign up for Aliexpress to get great deals. 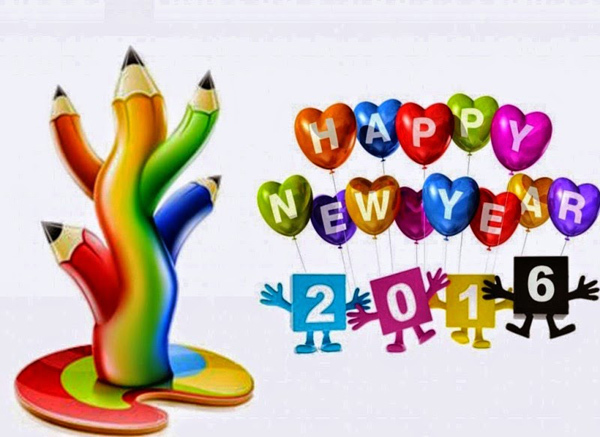 Have a great time shopping . Remember, Black Friday sales and the massive Cyber Monday Sales !